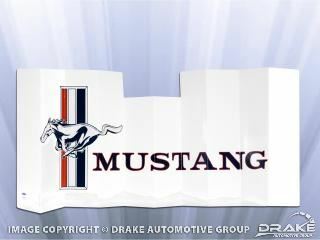 Keep your cabin cool while protecting your Ford Mustangs interior from harsh heat and UV rays with Drake Automotive Groups new fade resistant windshield Sun Shade for the 1964-73 Mustang. Officially Licensed by Ford, this accordion style Sun Shade features the classic Tri-Bar and script logo that spans the width of the Sun Shade and is made out of heavy duty bright white glossy card board. Folds flat for easy storing when not in use. Reverse side features the Drake Automotive Group logo.